Five women suffered varying degrees of injury early Sunday morning, July 21, at about 2:30, when two women crashed a party at #3799 Iguana Street Extension, and a stabbing “free for all” erupted among them and three women from the party. The women were taken to the Karl Heusner Memorial Hospital, where four were released, but the fifth complained of pain in her chest after she was stabbed in her upper breast. Saysha Moody, 18, a resident of #3799 Iguana Street Estension, was charged today, Monday, after a report was made against her that she caused a wound to Kendra Smith’s left wrist. According to police, on Saturday night, Moody was having a party at her residence when Kendra Smith, 21, and Lyvette Brown, 19, showed up at her party uninvited, and attacked her. Police later recovered two knives from the scene of the fight. The first to have attacked her was Brown, followed by Smith, after which a fight ensued when some of the party-goers attempted to intervene on Saysha’s behalf. At the end of the fight, Moody had suffered a cut to her right thumb and two stab wounds in the left side of her stomach, while Smith suffered a wound to her left wrist. Although Moody, Smith, Brown and a minor were arrested by police, only Moody was dealt with today after Brown and Smith became unruly while in the holding cell at the court. The two women and the minor were returned to the police station until tomorrow, Tuesday, when it is expected that they will be read their charges in court. Moody pleaded not guilty to the charge and was granted bail of $1,000 and one surety of the same amount, and is scheduled to appear back in court on August 22, 2013. 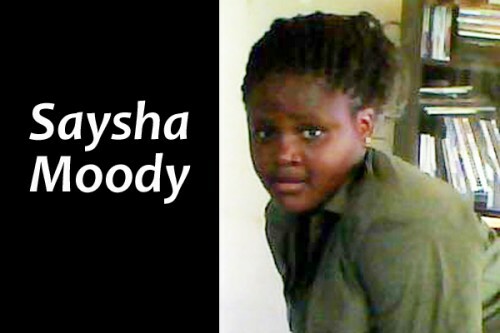 Initial reports are that Saysha Moody was cut on her right thumb and stabbed in the left side of her abdomen; her sister, 16, was stabbed in the upper left breast, and in the left upper shoulder, in the right side of the head and in the right leg. The girls’ mother told Amandala that her daughters were invited to a party at a house in their yard on Saturday night, and two girls with whom they were having an ongoing dispute told them that they would “disrespect” them on their own turf tonight. The mother said that about 2:30 Sunday morning as the party was over and as her daughters were coming home, they were attacked with knives. She said that a man who was along with the two female attackers held her younger daughter, during which time she was stabbed viciously in the breast and sliced on the head. Saysha shouted at him to let go her sister. Another woman who saw what was happening intervened, and she, too, was stabbed. The sisters then attacked their assailants, who also ended up being cut. The mother said that the beef is ongoing, and that her daughters were being threatened, but she did not expect that they would be attacked so close to home. The mother said that after her daughters were released, they were taken to the police station, where she went to look for them and that was when the attackers told her, the mother, that they would slap her anywhere they saw her. The mother said that she was surprised that they would talk like that to her, and a policeman told them that he would charge them with threatening words, and they then began to curse the policeman. The mother said that she should have called the police from the beginning when they told her daughters that they would disrespect them on their own turf. Her daughters were charged with wounding. The mother said that they were willing to drop the charges against their attackers, but the attitude of the two women prevented her from doing so.